No matter the skin type, skin can be sensitive and have adverse reactions. 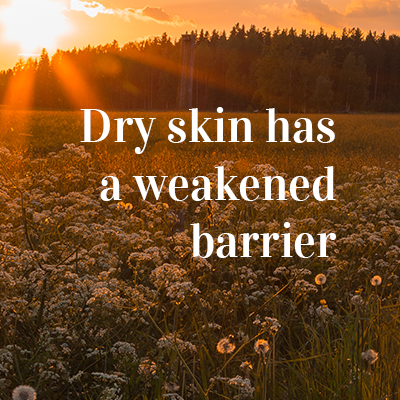 Sensitive skin is often dry in general or on the surface. Skin’s surface is tasked with protecting the skin and preventing moisture loss. With sensitive skin the functions of the skin’s barrier are disrupted, which may lead to reduced resistance. The skin may also be irritable. 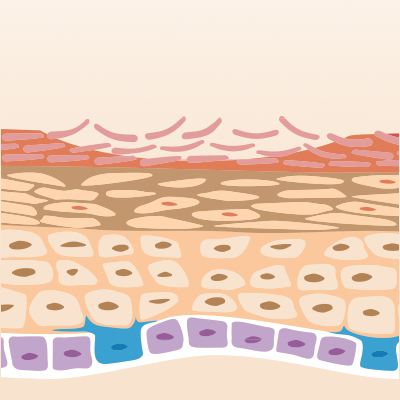 The extracellular matrix of sensitive skin has less ceramides and lipids than usual. This causes skin cells to detach from epidermis earlier than usual, which is seen as dandruff. This, in turn, leads to dry skin. Ceramides maintain the skin’s moisture balance while lipids protect skin from excessive moisture loss. The oat oil contained by Atopik products moisturises and soothes skin by giving it ceramides, lipids and natural vitamins. The skin identical active ingredients and skin soothing raw materials in Atopik products reduce the reactions that dry or sensitive skin may have to cosmetics. Dry skin greatly benefits from the use of Atopic products, which support its natural functions. Natural oils and skin identical raw materials moisturise skin effectively and fill in the gaps in epidermis. Atopik products give the skin the ceramides and lipids it desires in a natural form. Atopik creams can be used to reduce dryness in skin and to enhance its natural softness and protection.